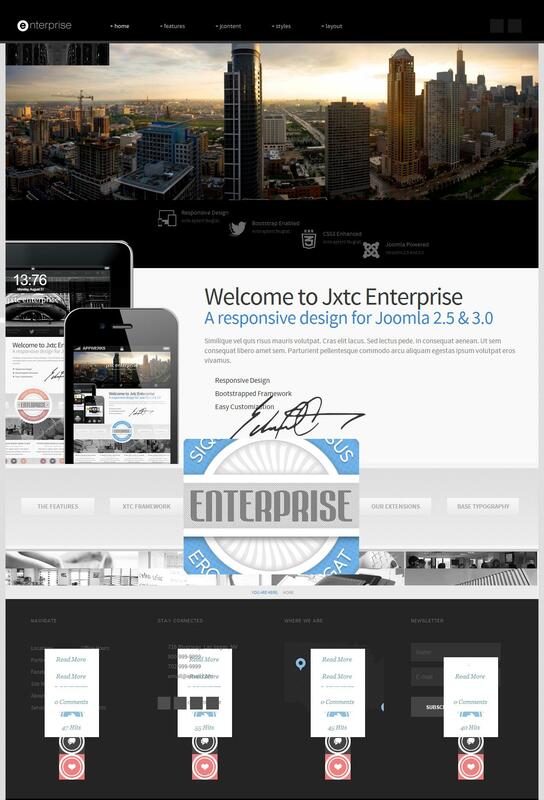 JXTC Enterprise - a professional business template themes for Joomla 3.0 from the team JoomlaXTC. This template has a great design that will appreciate the site's users and customers of your business. The template presented the latest technologies that provide fast website loading speed, support a variety of mobile and tablet devices, good code optimization and more. In the assembly includes popular extensions: Easy Image Gallery, Deluxe News Pro, flexible commenting system running Komento and components electronic mailings AcyMailing. Updated studio platform XTC Framework provides full access to all the settings layout options, so there is a unique opportunity to give the site an original and unique appearance.